WASHINGTON, Oct 31 2012 (IPS) - With less than a week left in the 2012 election campaign and much of the Northeast recovering from Hurricane Sandy, President Barack Obama and his Republican challenger, former governor Mitt Romney, are running neck and neck in the national popular vote, according to the most recent surveys. Online bettors and seasoned political analysts, however, appear to agree that by virtue of his edge in about nine key battleground, or “swing” states, the president will most likely emerge victorious after the final ballots are cast on November 6. Instead of a direct popular vote, the presidency is determined by the electoral college, through which each state is allocated a certain number of votes based on their representation in Congress. Almost all states use a winner-take-all formula, so that the candidate that wins a majority receives all of a state’s electoral votes. With most states either solidly “red” (Republican) or “blue” (Democratic), “purple” swing states are critical. Residents of those states, which include Florida, North Carolina, Virginia, New Hampshire, Ohio, Wisconsin, Iowa, Colorado and Nevada, are being bombarded around the clock with last-minute radio and television campaign ads as well as robocalls and other telephone exhortations on behalf of not just the presidential contenders but candidates for state and local elected positions as well. In the critical swing state of Ohio, which nearly all analysts consider a top prize, in part because no modern Republican candidate has won the presidency without it, is also leaning toward Obama, although one top political analyst, Charlie Cook of the “National Journal”, still considers it a “toss-up”. With one of every eight jobs in that state dependent on the auto industry, the Obama campaign has been pounding away for months at Romney’s opposition during the financial crisis four years ago to the federal bailout of an industry which has since rebounded remarkably well. Romney may have compounded his problems there this week when his campaign began running ads falsely claiming that Chrysler’s Jeep division was outsourcing U.S. jobs to China. The assertion drew harsh denunciations from Chrysler’s CEO and General Motors. “You have to think the Jeep/China falsehood could be the nail in the coffin there,” noted Chris Nelson, a well connected political and foreign policy analyst, in his daily Nelson Report Tuesday. While the polls have yet to reflect it, Obama may ironically benefit in the closing days of the race from the hurricane itself, primarily because it enabled him to be shown supervising the federal government’s response, effectively pushing Romney down and, in some cases, even off the news agenda. The praise showered on the president’s handling of the “Frankenstorm” by two Republican governors, notably Chris Christie of New Jersey, was no doubt poorly received at Romney’s campaign headquarters. The closeness of the presidential race is indicative of how deeply and evenly split the country is, despite clear divides along different geographic and demographic lines. The geographic divisions between blue and red states are the most obvious. With key exceptions in each region, the old South and most of the Midwestern and Rocky Mountain states are firmly in the Romney camp. On the other hand, the Northeast and the three West Coast states are solidly Democratic, as are most of the Rust Belt states of the upper mid-Atlantic and Great Lakes region. While geographic divisions loom large, demographic differences have also emerged as potentially decisive. In a Washington Post/ABC tracking poll, well over 80 percent of non-white voters said they intended to vote for Obama while over 91 percent of Romney’s backers are white. 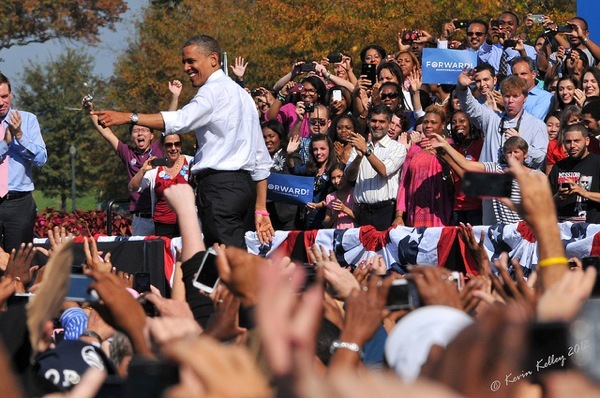 Ninety-three percent of African-American voters said they would vote for Obama, and only two percent for Romney, with the rest still undecided, according to a Pew poll released Monday. If their turnout is high, their votes could be decisive in North Carolina, Virginia, and Florida, all three of which went for Obama in 2008 and are considered tossups by Cook and others. Obama was also favoured by 69 percent of Latinos in an impreMedia-Latino Decisions survey released Monday. A high Latino voter turnout, particularly in the battleground states of Colorado, Nevada, Iowa, Virginia and Florida could also swing those states in Obama’s favour column, ensuring his victory even if he loses Ohio. Despite repeated efforts by Romney and the Republicans to paint Obama as anti-Israel, Jewish voters appear poised to vote by a solid majority for the president. If that prediction holds, it could make a difference in the two biggest electoral prizes – Ohio and Florida. Age groups also could play an important role, especially if younger voters (ages 18-29), who historically have been the least likely to vote, turn out at higher rates. Obama leads that age group by more than 20 percentage points, according to the Pew poll, while the numbers are nearly reversed for voters 65 and older. Similarly, most polls show a gap between men and women voters, although it has narrowed significantly in the past month as Romney moved sharply to the political centre after hewing closely to the positions of his party’s far-right populist core during the primary campaign. The Pew poll found a seven-percent margin for Romney among male voters, and a six-point margin for Obama among women. Until the last few weeks, the gaps for both genders were more than twice their current sizes. Overall, the Pew poll, conducted last weekend, found a dead heat between the two men in the popular vote. Other polls released this week have found the same results or one or two percentage points in favour of one or the other – all within the margins of error, however. Still, most analysts believe Obama is likely to win, given his edge in most of the swing states. At the online betting site, Intrade, Obama’s chances of winning are at about 67 percent, up from 55 percent in mid-October. His odds have also risen about five percent since Monday, when Hurricane Sandy hit land. Nate Silver, the New York Times’ polling and statistics guru, now puts Obama’s odds at 77.4 percent. Silver predicted Obama will win both the popular vote (by about two percent) and the electoral vote with all swing states except North Carolina and Florida.